20 July :Ajmal Kasab, the lone surviving terrorist in the November Mumbai terror attack on Monday pleaded guilty to his role in the crime, that came as a major boost to the prosecution and can also bring the trial to an early conclusion. “I plead guilty,” the 22-year-old Pakistani national told the Special Court in the Arthur Road jail in Mumbai trying him for various charges including the shooting in the Chhatrapati Shivaji Terminus (CST) railway station that killed over 50 people and injured 90 others on 26th November last year. The confession of Kasab, who had earlier pleaded not guilty and claimed he was a minor, came after a very brief consultation with his lawyer Abbas Kazmi as the prosecution’s 135th witness stepped into the box for giving evidence on the 65th day of the trial that began on 17th April. Special Judge M L Tahiliyani heard Kasab telling him that he owned up his involvement in the attacks in CST and the nearby Cama hospital in south Mumbai and later killing three policemen apart from planting a bomb in taxi. Ujwal Nikam, the Special Public Prosecutor in the high-voltage case, hailed the confession as a big victory for the prosecution saying the “cat is out of the bag”. The confession could be due to the fact that the Federal Investigation Agency (FIA) in Pakistan has filed a chargesheet in a court in Rawalpindi in which Kasab was admitted as a Pakistani national, he said. Maharashtra Chief Minister Ashok Chavan said the trial should be completed quickly and all those involved in the attacks should be hanged. On a day of dramatic development, Kasab admitted that he came in a boat from Karachi along with nine other terrorists to carry out the dastardly acts on the night of 26th November in four places including the iconic Taj and Oberoi Hotels. When a prosecution witness Constable Arun Jadhav, who was in the vehicle in which three top police officials ATS chief Hemant Karkare, Ashok Kamte and Vijay Salaskar, were killed near the Cama Hospital, stepped into the box today Kasab sought permission to speak to the lawyer Abbas Kazmi. He spoke to his lawyer for 30 seconds and the lawyer informed the court that Kasab wanted to confess. Special public prosecutor Ujjwal Nikam objected saying at this stage during the trial, the accused could not confess before the court. The objection was overruled and Kasab was allowed Kasab to confess. In the witness box, Kasab described how he and slain terrorist Abu Ismail opened fire at the CST station. “Mein firing kar raha tha aur Abu hand grenade phek raha tha..mein Abu ke aage tha..Abu ne aisi position li thi ki usse koi dekh nahi sakta..I fired a policeman..Uske baad police ke side se firing bandh hogayi..(I was firing and Abu was hurling hand grenades. I was in front of Abu who had taken such a position that no one could see him. I fired at a policeman after which there was no firing from the police’s side),” Kasab told the court. Kasab also told the court how he and Abu exited from CST from a foot over bridge and proceeded towards the Cama hospital. Kasab was arrested on the night of 26th November at Girgaum Chowpatty in South Mumbai in a police encounter while his partner Abu Ismail was killed. In the 11,000-page chargesheet, the Mumbai Crime Branch cited 35 Pakistan nationals and operatives of Lashkar-e-Taiba (LeT) as wanted accused in the case. They include Zaki-ur-Rehman Laqvi, Yousif Muzammil, Abu Kahfa, Abu Ramza and Zarar Sahh. It also includes the names of two suspected armymen- Major General Saab and Colonel R Saadat Ullah. 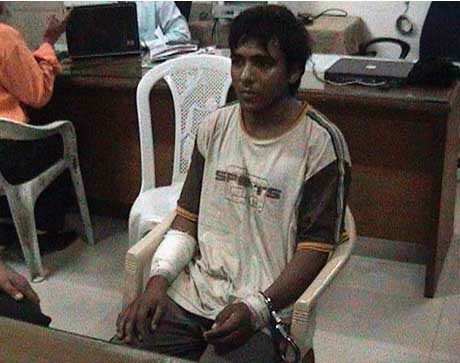 While confessing, Kasab described to the court how he and Abu exited the CST and proceeded towards Cama hospital. He said that he and Abu jumped the wall of Cama hospital after which Abu asked him to wait there. “Thode der baad Abu wapas aaya aur mujhe andar aane ko kaha…andar gate ke paas ek lash padhi thi…(After sometime Abu came back and asked me to come inside..Inside near the gate there was a dead body),” Kasab said. He further said that inside, Abu conducted searches on three persons and snatched their mobiles and bags. One of the witnesses, Sriwardhan, an employee of Mantralaya, was lying unconscious on the floor, Kasab said. ” JAI HO ” to Special Court & Indian Judicary System for the Verdict. Mumbai Police ” FAILED ” to do Home Work on 2 acquittals. Would now they ” SUE ” the State or Govt to accuse them? Politicians popped up like Mushroom Tops after verdict for statements, but would not come out to take Death Penalty on ” FAST TRACK ” if given. Unnecessary Powers to Useless Politicians is more dangerous like Terrorism. Mercy Petitions on Death Penalty from Home Ministry & President must have ” TIME LIMIT ” of 1 year, and if they fail to do so the Death Penalty must stay. Its a Shame on Govt to decide and waste years on it. Many PAK Terrorists are Enjoying Indian Gesture in Jail like ” SON-in-LAWS “. TILL TODAY, HOW MANY ” TERRORISTS ” ARE HANGED IN INDIA?